It all comes down to the age-old question: should I repair my roof, or should I get a full-on roof replacement? 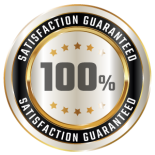 Well, if you’ve ultimately decided that a roof replacement is the best option for you, congratulations! You’re about to reap in multiple benefits of replacing your roof, especially if your roof was on the older side or entirely beat to a pulp. In this blog, we’ll go over five of the many benefits of roof replacement for your Dallas home. At Hometown Roofing, LLC., we’re best known in the community for providing excellent customer service and for connecting our clients with high-quality roof materials for their homes. From emergency roof repair services to helping you determine ideal environmental roofing solutions for your home, you can trust our roofing professionals to always put your best interests first. 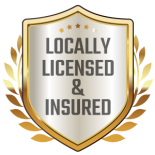 Choose our locally licensed and insured Dallas roofing company that has more than 34 years of experience, and contact our team today to schedule an appointment. 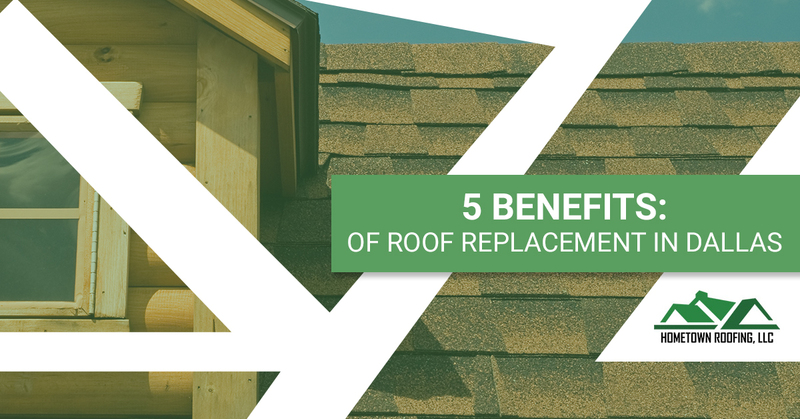 Continue reading below to learn more about how roof replacement will benefit you as a homeowner. 1. The value of your property will increase. As a homeowner, it’s great news to hear when the value of your property increases, and when you fully replace your roof, that’s the exact thing that will happen. Making this investment now will help when (or if) you decide to sell your home in the future. It makes sense — no new homeowner will want to purchase a roof with a ton of issues. 2. Your energy bills will decrease and your home will become more energy efficient. Who doesn’t wanna save on energy bills? When you opt for roof replacement for your home, you will notice a significant difference (specifically, a decrease) on your monthly energy bills. In this day and age, energy efficiency is extremely important for not only your wallet, but also for the environment. 3. Your home’s interior will be better protected from inclement weather. Your roof’s sole purpose is to keep you and your family safe. When you have a shotty roof, your chances of harm or disturbances inside of your home are higher. Replacing your roof will replace your old, weak roof material with stronger, new material, which ultimately will better secure the interior of your home from less-than-ideal weather conditions. 4. Your home’s curb appeal will go up. This benefit is more of aesthetic value than anything else, but it’s still a benefit nonetheless. When you replace the roof on your home, its overall curb appeal will increase. You’ll likely have brand new materials of your choice in the color of your choice, and it’s always nice to come home to a house you’re absolutely proud of owning. Believe it or not, a new roof will give you that exact feeling! Fun fact: Data has shown a brand new roof will increase your home’s curb appeal as much as 40 percent. 5. You’ll have peace of mind. Last, but certainly not least, you’ll have a new peace of mind when you fully replace your roof. Chances are, your former roof was giving you major constant headaches, whether it was from the leaks that would occur following a rainstorm or it was simply an eyesore from all it’s broken and shattered shingles. 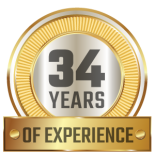 When you opt for roof replacement roofing services from Hometown Roofing, you can trust that we’ll get the job done correctly and on time, and that you won’t have to worry about your roof again for at least another 15 years or so. At Hometown Roofing, LLC., we offer several commercial and residential roofing services to the Dallas community. Whether you require a minor roof repair or you need assistance dealing with a roof insurance claim, our experienced and qualified staff members can help you get the job done.We also are known in Dallas for our excellent roof replacement services that will leave you with the best looking and most efficient roof in your neighborhood. Please feel free to reach out to us for a free roof inspection or for another roofing service of your choosing. We’re available 24 hours a day for any emergency situations you may be caught up in. You can reach us by calling (888) 798-2917 or by completing our online form.